It has come to the point where I should probably stop saying I don’t like musicals. I have never had much interest in the genre, but the last few I have seen — Moulin Rouge, My Fair Lady, Dancer in the Dark — I enjoyed quite a bit. 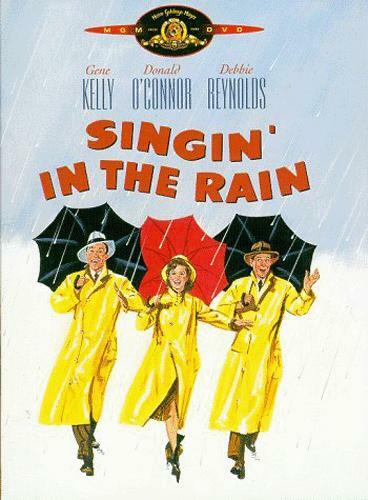 Now I can add another to this quickly growing list: Singin’ in the Rain. What can be said about this 1952 classic that hasn’t already? The songs have been immortalized in American pop culture, so much so that I hear the title song during every trip to the local Jewel Osco grocery store (it plays when the produce sprinklers kick on). The film’s influence is massive — The Artist bears more than a striking resemblance — and it has all sorts of accolades to its name: two Oscar nominations, eight mentions in multiple AFI lists, a ranking of #86 overall on IMDB, a rare 100% fresh rating on Rotten Tomatoes. And, to top it all off, it is considered one of the greatest musicals of all time. The film’s story is a simple one. Gene Kelly stars as Don Lockwood, a wildly popular silent film star who has been on a roll lately thanks to his collaborations with leading lady, Lina Lamont (Jean Hagen). With the onset of talking pictures looming, their studio, Monumental Pictures, decides to make the transition. 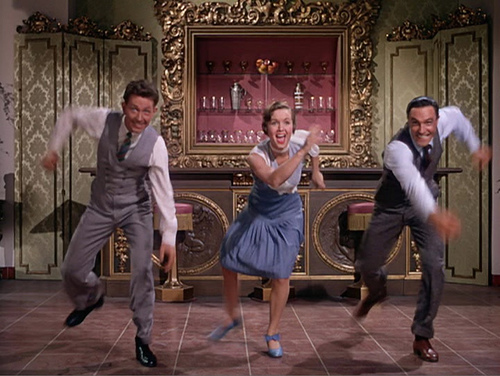 Lockwood and Lamont are up to the task, but there is one small problem: Lamont’s voice is far too grating for “talkies.” At the suggestion of Don’s best friend, Cosmo Brown (Donald O’Connor), the studio decides to dub Lina’s voice with that of Kathy Selden (Debbie Reynolds), Don’s new flame. Naturally, conflicts arise because of this, but this is a light-hearted musical and it doesn’t get into dark territory at all. Really, this is all about the song-and-dance numbers, and they sure deliver. This was my first Gene Kelly film, and his performance blew me away. Not only is he ridiculously charismatic, but the dude can dance, too. The choreography in this is just insane, and his numbers with Donald O’Connor and Debbie Reynolds ae often mind-boggling. Some of the physical stunts they pull during their routines are beyond impressive. The three of them have natural chemistry, making their complex numbers look effortless. 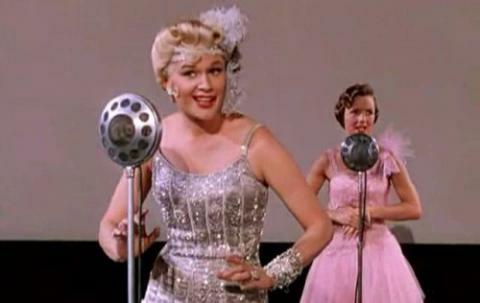 Jean Hagen is also a treat as the stereotypical dumb blonde, and she was rewarded with a Best Supporting Actress nomination. My only beef with the film comes from O’Connor. While I appreciated his talents, I found his character to be a little too silly/over-the-top for my liking. I know that many love his big solo routine, Make ‘Em Laugh, but it was just too slapstick for me. Regardless, that is just a small blip on what is otherwise a fantastic musical. 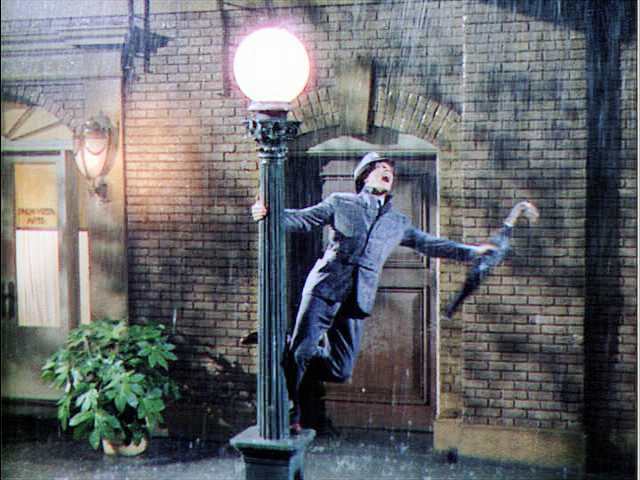 Singin’ in the Rain really is a delight, and it is just one of those rare movies where it’s near impossible to not have a smile on your face for most of its running time. Plus, something must be said if a film has made me second-guess my stance on its genre — maybe there’s something to this, after all? Hey thanks for the link love! Yes this movie is a delight indeed. I actually like O’Connor’s slapstick-ness, I thought he was such a fantastic dancer. There were some really corny moments but like you said, a small quibble in an otherwise wonderful musical! No problem, Ruth. I think it’s cool that we both saw this for the first time this month. O’Connor was a terrific dancer, for sure, but Make ‘Em Laugh was just too much for me. Still loved the film overall, though. Just an awesome awesome movie. Defines “Classic” to me. No problem, dude. Glad to send some kind folks your way. Totally agree with the addition, BTW. This is one classic I resisted for years because everyone says you HAVE to love it. I figured it would be like Citizen Kane (which btw I have not seen), i.e. boring but beloved by old-timers.Turns out it’s ADORABLE. Kathy making fun of Don in the car, him laughing at her as she jumps out of the cake.. it’s all just so sweet and fun and happy. love love love. If you’re looking for another cute-funny musical (with some great barn-raising dance numbers), try Seven Brides for Seven Brothers. NO ONE should be able to say they don’t love musicals! Haha, well I still won’t go out of my way to see a musical, but I do have a new found appreciation for them! I’ll keep an eye out for Seven Brides for Seven Brothers, though. Appreciate the rec! And you should give Citizen Kane a shot. I know some people considering it boring now, but it was one of the first B&W films I fell in love with. One of the all-time greats, and deservedly so. Right on! Sounds like we had a similar reaction to our first viewings then. 🙂 Thanks for the comment! Yeah, it’s a classic that holds up remarkably well today. I think you’ll have a blast with it, Scott. Fun for the whole family. Great post, I’m going to have Good Morning in my head for ages now. Keep up the good work. Cheers, Vinnie. That’s a catchy jingle, isn’t it?